This post is sponsored by Driscoll’s, but all opinions are my own. 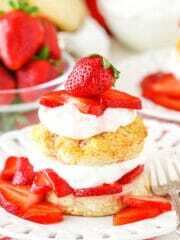 Did you know that June 14 is National Strawberry Shortcake Day? It’s true! 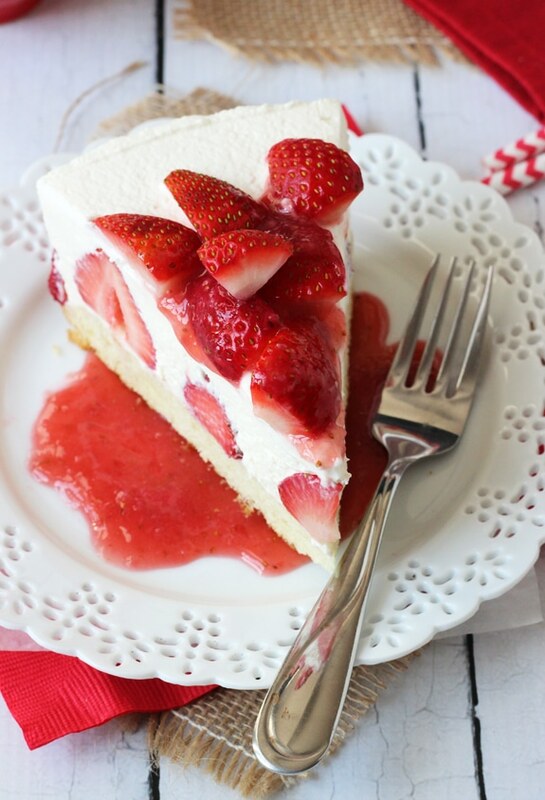 So today I am celebrating with this Strawberry Shortcake Cheesecake. 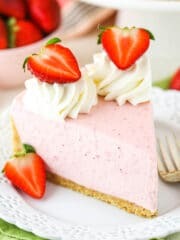 This beautiful Strawberry Shortcake Cheesecake combines three of my favorite things – cake, strawberries and cheesecake – into a beautiful dessert that is perfect for celebrating! If you’ve been reading the blog a while, then you know I love strawberries. They’ve been my favorite fruit since I was a kid. My dad will still buy them for me when they’re in season and I’m coming to visit. When trying to figure out what spin to put on the traditional dessert, this cheesecake was one of a few ideas that quickly came to mind. 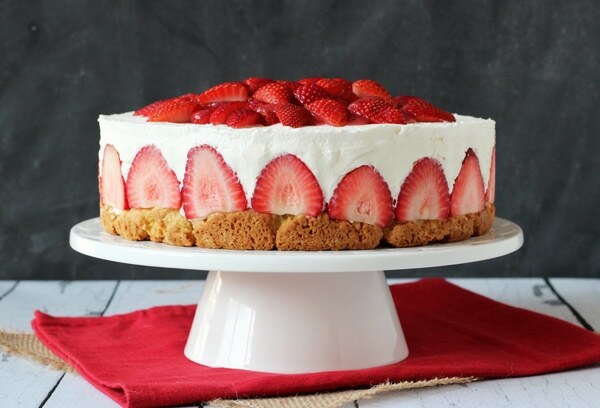 It’s such a great showcase for the strawberries and with a full layer of shortcake on the bottom, you get the full strawberry shortcake experience layered right into a cheesecake! I started off making this recipe by making the shortcake. Believe it or not, I’d never made a shortcake from scratch before! Shortcake is a little different than your typical cake. It’s a little like a sweet biscuit, but with a slightly cakey-er texture. It’s more crumbly than a cake, though. So for the shortcake recipe, I went straight to the experts – Driscoll’s. I borrowed the shortcake from their favorite strawberry shortcake recipe. It is so easy to make. Even easier to make than a cake. The shortcake is topped with a thin layer of cheesecake, just to hold things together, and then topped with whole strawberries. Aren’t they beautiful nestled in there? 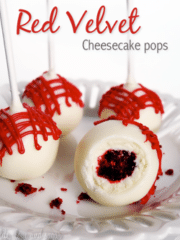 Then they are completely covered with a light, no-bake vanilla cheesecake and some whipped cream. The cake is then topped of with a few more strawberries and some strawberry sauce. Absolute perfection! The combination of flavors and textures is spot on. The dense, crumbly cake with the fresh, sweet berries and the smooth, creamy cheesecake is just as perfect as you’d expect. 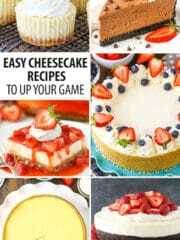 And it incorporates all the flavors of a good strawberry shortcake into a super fun and delicious cheesecake. You seriously won’t want to share. So it’s time to get your ingredients together and your Driscoll’s strawberries. Let’s celebrate National Strawberry Shortcake Day! Yum! 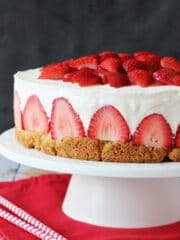 Celebrate National Strawberry Shortcake Day with this amazing Strawberry Shortcake Cheesecake recipe! One dessert with cake, strawberries & cheesecake! 1. Preheat oven to 375 degrees. Place a circle of parchment paper into the bottom of a 9 inch springform cake pan and grease the sides. 2. Combine flour, sugar, baking powder and baking soda in the bowl of a food processor. 3. Add butter and mix in food processor until combined and mixture resembles coarse crumbs. 4. Slowly add heavy cream and pulse in food processor until just moistened. 5. Gather dough into a ball. 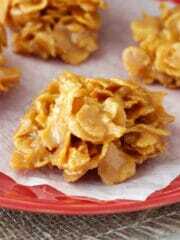 Mixture will still be crumbly and loose. 6. Gently knead dough on a non-stick surface until just smooth, about five turns. 7. Press dough into an even layer in the springform pan. 8. Bake for about 20 minutes or until edges are golden. 9. Remove cake from oven and remove from cake pan. Allow to cool on cooling rack. 1. Freeze metal bowl and whisk for 15 minutes. 2. Remove bowl and whisk from freezer and add 1 cup of heavy cream. 3. Whip on medium-high speed for a few minutes. Cream will initially bubble a little bit, then start to thicken. 4. As the cream starts to thicken, add 1/2 cup of powdered sugar and 1/2 tsp of vanilla extract. 5. Whip until soft peaks form, for a total whipping time of about 5-7 minutes. Make sure not to over mix. Set whipped cream aside. 6. Add cream cheese to a large bowl and beat until smooth. 7. Add 1 tsp vanilla extract and sugar and beat until smooth. 8. Fold in whipping cream made in steps 1-5. Set aside. 9. Freeze metal bowl and whisk for 15 minutes. 10. Remove bowl and whisk from freezer and add remaining 1/2 cup of heavy cream. 11. Whip on medium-high speed for a few minutes. Cream will initially bubble a little bit, then start to thicken. 12. As the cream starts to thicken, add remaining 1/4 cup of powdered sugar and 1/4 tsp of vanilla extract. 13. Whip until soft peaks form, for a total whipping time of about 5-7 minutes. Make sure not to over mix. Set whipped cream aside. 1. Add water to pureed strawberries. 2. Combine sugar and cornstarch in a saucepan. Stir in strawberry puree. 3. Cook over medium heat, stirring constantly until mixture thickens and come to a boil. 4. Allow to boil for 1 minute, then remove from heat. 5. Allow to cool while you put everything together. 1. Wash and dry strawberries. 2. Slice about 6 strawberries into thin strawberries to use around the outside edge. 3. Cut the tops off of about 3 cups of small to medium sized strawberries (about 18-20 strawberries). 4. Line the same 9 inch springform pan used for the shortcake with parchment paper on the bottom and sides. The parchment paper should stick above the edges of the pan about an inch or 2. 5. Place shortcake in the bottom of the pan. 6. Line the sides of the pan with the sliced strawberries, using the prettiest slices. 7. Add about 1/2 cup of the cheesecake filling on top of the shortcake and spread into a thin layer, filling ing any gaps around the shortcake and sliced berries. 8. Place the strawberries, thick side down, on top of the cheesecake. Leave some space between each of the strawberries so that they aren’t touching and cheesecake can be added to fill in the space. 9. Drop remaining cheesecake filling on top of the strawberries in spoonfuls, making sure it fills in all the spaces. Spread the remaining cheesecake evenly over the strawberries. Depending on the size of the berries, they might poke through the top of the cheesecake a bit. 10. Spread whipped cream topping on top of the cheesecake. 11. Cover loosely and refrigerate until firm, about 4-5 hours. 12. Once firm, remove cheesecake from spring form pan and top with remaining strawberries, but into quarters. 13. 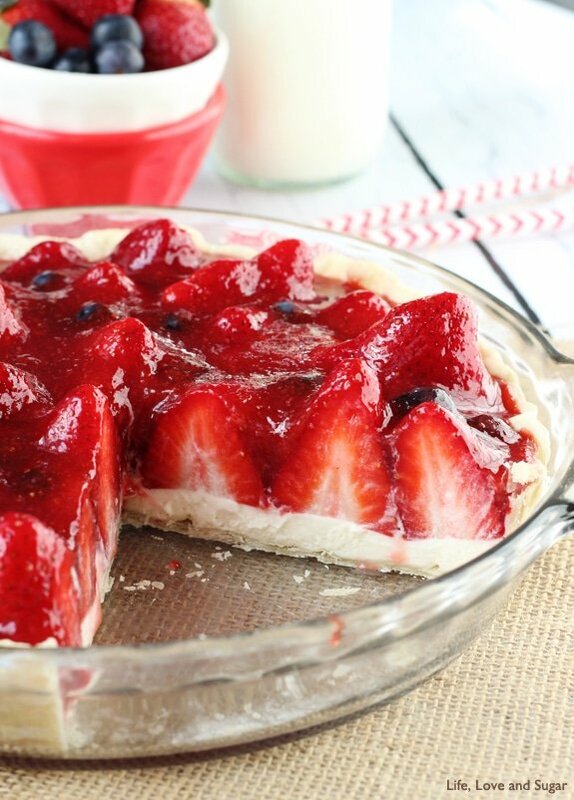 Drizzle with strawberry sauce and refrigerate or serve. National strawberry shortcake day? 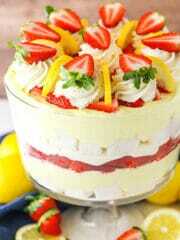 Have never heard of that but I like the way it sounds and the way your cake looks.. yummy! I’m going strawberry picking this weekend. This looks like an awesome use of those strawberries. I just can’t say no to cheesecake! I love strawberry picking – yum! This would be perfect! This is so beautiful! I am so in love and I adore the thick crust on the bottom! How much salt do you use in the shortcake batter? Also, could you use pre-made whipped cream? If so, how much would you use? Yes, you can. About 8 oz for in the cheesecake and about 4 oz for the topping. You have to give the berries the sniff test no matter how many strange looks you get! Let them take home the less ripe ones. 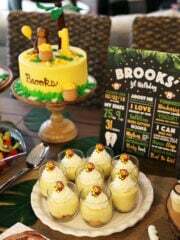 I LOVE your concept for this cheesecake! What a great idea! And it’s absolutely beautiful as a bonus! 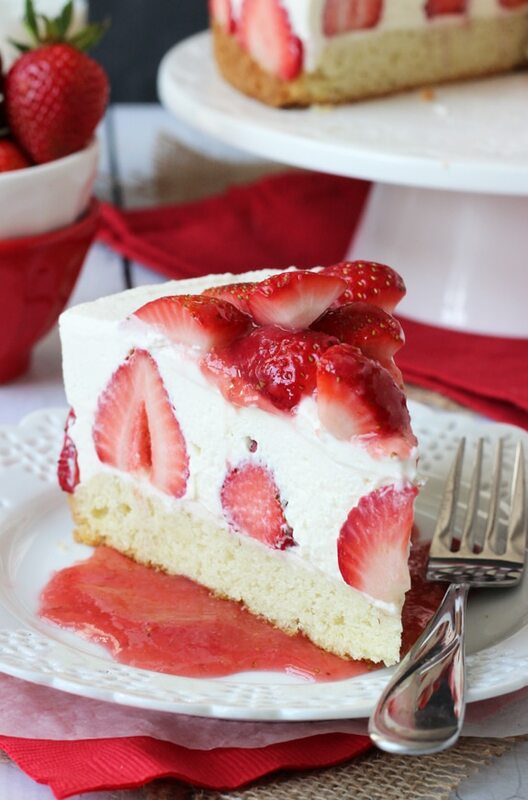 I love strawberry shortcake and cheesecake, so I’m all over this. Yum!! Wow, this is stunning, and I am sure tastes amazing, too! Hello, do you have to use a metal bowl? I usually my metal mixer bowl, but a glass bowl should be fine. What an absolutely gorgeous looking cheesecake!!! 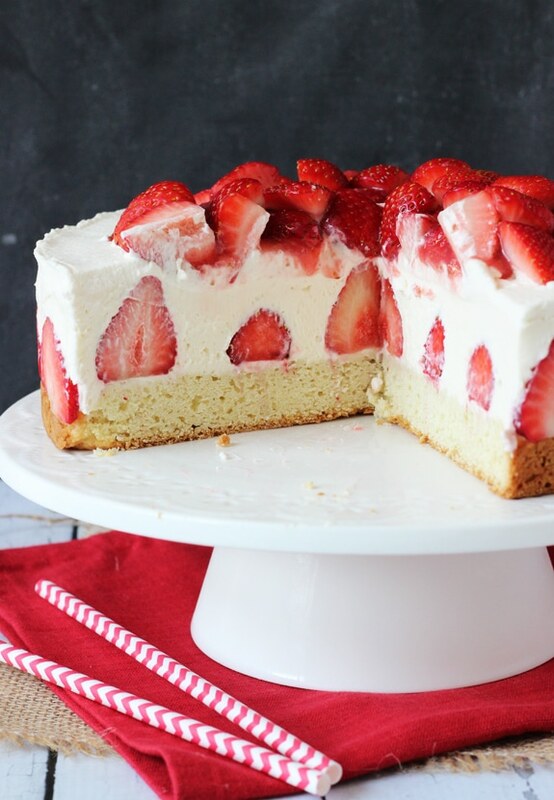 I love all the strawberries standing up in the cheesecake layer! It is stunning girl! This cake is just plain gorgeous!! I want a giant slice right now! It’s so pretty when you cut into it! Just wondering… did you put whole strawberries inside the pie or half like around the edge? Your great pics had me sold on this! I’m going to make it for a BBQ this 4th. My only fear is that the berries around the edge will stick to pan? Any advice? I have whole strawberries inside the cheesecake and just thin slices around the outside edge. To make sure the berries on the side don’t stick, you can line the edge of the pan with parchment paper. Then after you removed the springform pan, you can just peal back the parchment paper. I made the shortcake/cheesecake. I’m not a really regular baker so when I came across 2/3 cup Corn starch for the strawberry sauce I did not really think at first it was a problem. This is a major typo. Adding this much corn starch turns the sauce into the thickest, grittiest, inedible paste. 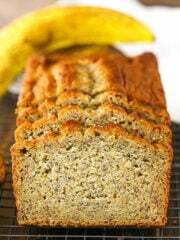 The recipe does need to be edited, to show about 1/8 cup at the ;most. I know experienced bakers would not make my mistake., but I was lucky to have more strawberries to redo the sauce this time. Hi Sharon, I’m so sorry about the trouble with the sauce. You are right that it is a typo and I want to get that fixed. Just to make sure I understand – you used the recipe on the Driscoll’s website, right? When I look at the recipe, I actually see 3/4 cup of cornstarch. Are you seeing 2/3 cup somewhere? It’s actually supposed to be 3/4 tsp, so I’m working with Driscoll’s to get that corrected. If there’s another place where you’re seeing 2/3 cup, will you let me know, so I can get it fixed? Thanks so much for pointing out the error! Hi! 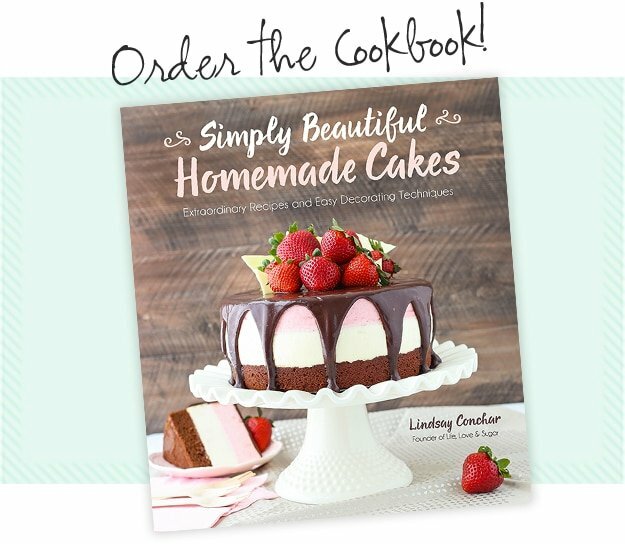 This recipe looks amazing; however, I am hesitant to make this due to the differences in measurements from the Driscoll website. The sauce ingredients lists 2+ Tablespoons of cornstarch for the sauce-which is correct, 3/4 of a teaspoon or what their recipe lists? I would love it if you would post the actual recipe as it’s to be made on your website. Hi Sheryl! I’m sorry for the confusion. I looked at the recipe on their site and it looks like they’ve made some changes to the sauce – everything else is the same. It appears they’ve increased the amount of strawberry sauce by a little more than double. I primary used the sauce to lightly drizzle over the top of the strawberries and they’ve added a little more. If you prefer, you could cut the sauce recipe in half. Unfortunately because of the way this particular partnership worked, I can’t post the recipe on my site. I’m sorry. It’s a wonderful cheesecake though and like I said, nothing but the sauce has changed. 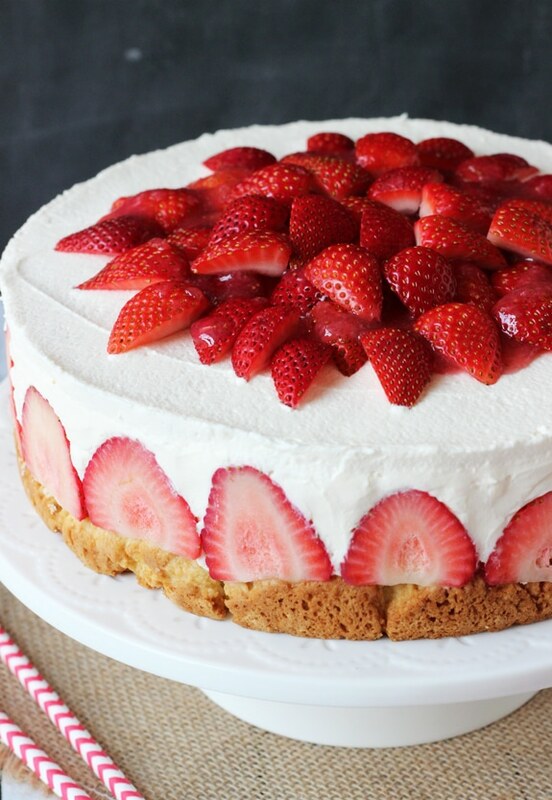 Could you please post the recipe for this fabulous-looking Strawberry Cheesecake? All I was able to find on this page was a link to the Driscoll’s shortcake recipe (personally, I’d just use Bisquick to save time, and I also don’t care for a sweet shortcake). 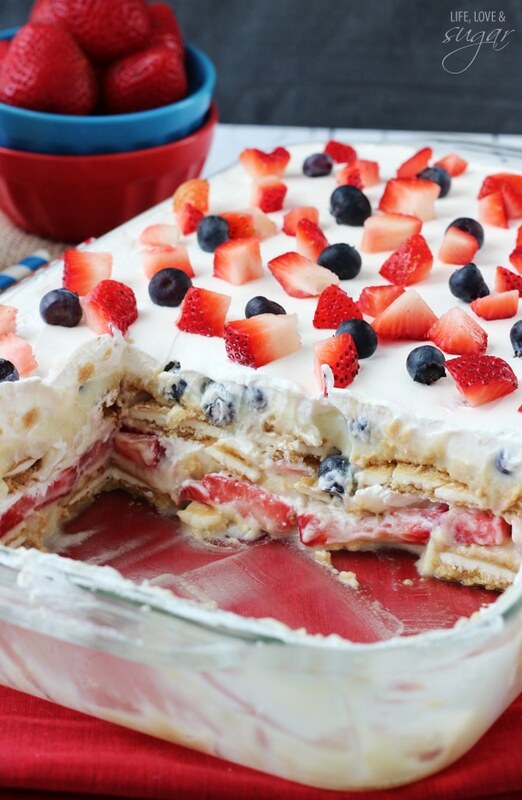 I’m hoping to make this for a spring or summer family picnic, so please let us know the list of ingredients for more than just the bottom layer. Thanks!!! Hi Peggy, the link is there, but it might have been hard to see. Here you go. It’s beautiful! 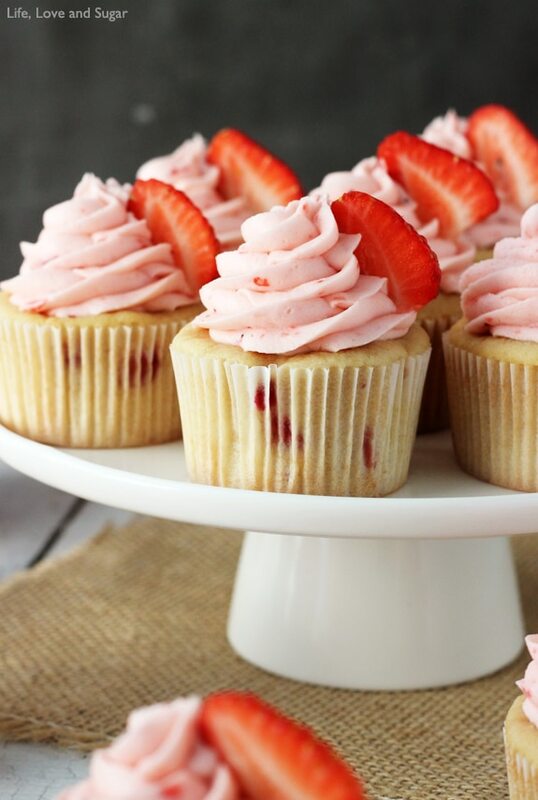 I love the strawberries on the sides! the recipe for the strawberry shortcake cheesecake has the whipped cream being made twice. It also fails to say which type of sugar and how much goes into the cheesecake. I’m in the middle of making it; I hope it turns out! Yes, part of the whipped cream is for in the cheesecake, the other part goes on top. I’m not sure where you’re having issues with the sugar – from what I can tell it says granulated and powdered in different places. If you have a specific question about the sugar for a part of the recipe, let me know. Enjoy it! Question about the pureed’ strawberries….how many/much for the strawberry sauce. First sentence says add water to the pureed strawberries….but I don’t know how many. Cannot wait to taste this later!. I’m sorry about that. It should say 1/4 cup of strawberry puree. There are so many ads on this page, I literally cannot even find the recipe. There is a link directly at the top of the post to make it easy to find. But here it is for you as well. 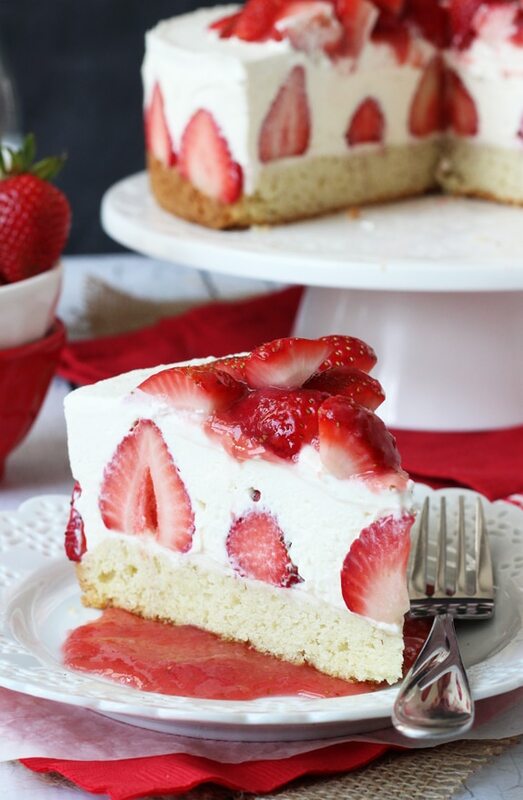 this strawberry shortcake cheesecake is absolutely amazing. My daughter had asked for a shortcake crust and I wanted to make a cheesecake. It was the best of both. I made it for Canada Day and it was a great success. How long would you say this could be refrigerated? It would be best if eaten within 24 hours since the strawberries can brown and get less fresh, but it should be ok for 2-3 days if needed. Just know that the strawberries might not be best at that point. It depends on the berries. I was wondering if #10-#13 under the cream cheese filling is necessary or a typo? Well, those steps aren’t a typo. 🙂 You can certainly make it a little simpler and not freeze the bowl, but that is how I make my whipped cream. If you have a method you prefer, feel free to use that. Love to hear that! 🙂 So glad you are happy with it! Air HUGS to you Lindsay. I made this for my birthday weekend. 🙂 Your instructions were to the tee! 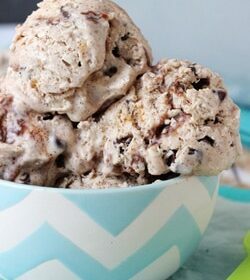 I have placed this yumminess in our top ten of desserts. It brings a smile to my face and heart every time I have a piece. 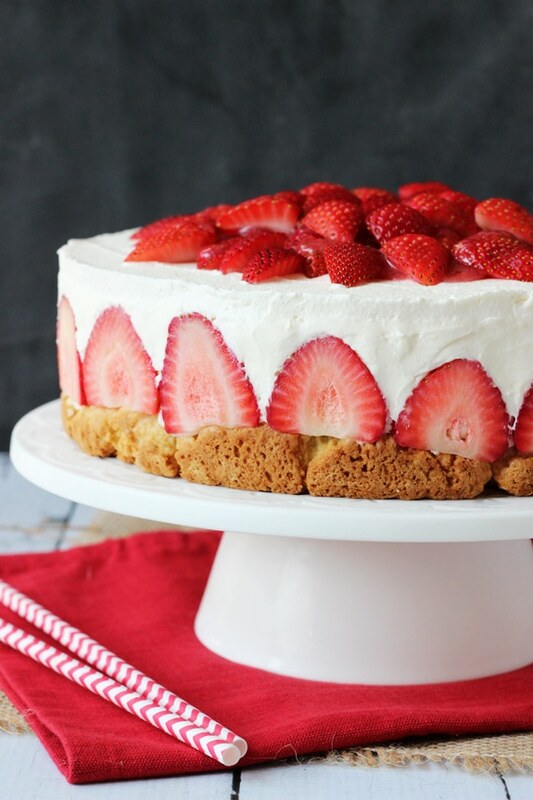 Could this recipe be made with a graham cracker crust instead of the shortcake? It looks amazing! I’m sure that’d be fine. It’d be a bit smaller cheesecake overall though. 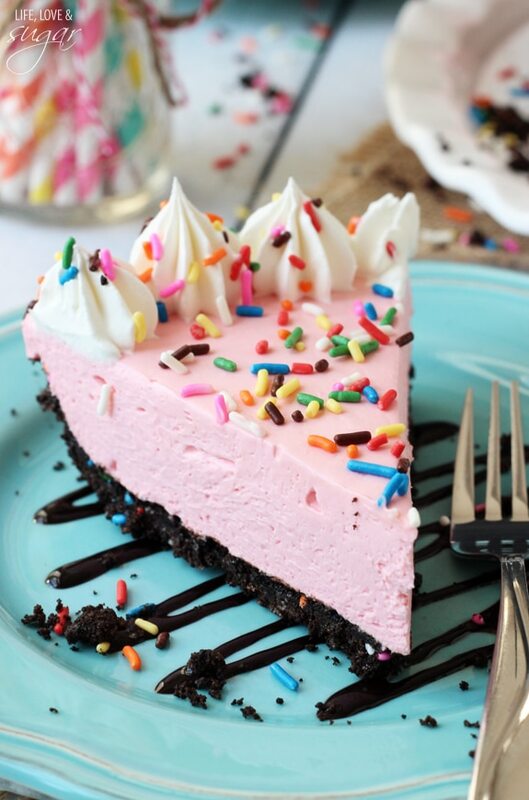 This piece of art cheesecake it on my, to do list. Thank you for such a work of art for the eyes as well as the stomach. Also, do you melt the 5 T. of butter in the shortcake recipe? Thanks Barbara! No, the butter should be cold. You’ll basically cut it into the dry ingredients. Yeerp, I think I will give this one a go next, Lord Willing. Overall I would definitely make this again for a BBQ or party but I will call my Nan and ask her for her shortcake recipe to substitute for the base on this one. I’m confused. I’m making the strawberry shortcake cheesecake. The second part says put metal bowl in freezer and whisk for 15 minutes. Whisk what? Remove bowl and whisk from freezer and and 1 cup of heavy cream. I’m not understanding this instruction. I made this cake for father’s day. My first attempt at a fancy “scratch” cake! It went over like gangbusters, gotta make another!! Where can I send pic? I’m sooo proud of myself! 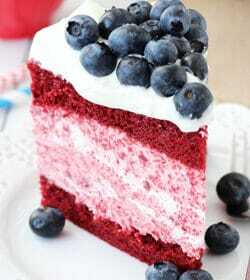 I can’t wait to make this cake! But I have a question. 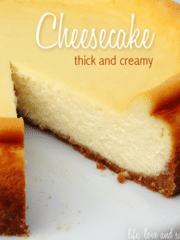 The recipe says to put a layer of whipped cream on top of the cheesecake layer, but the pictures show only one layer. 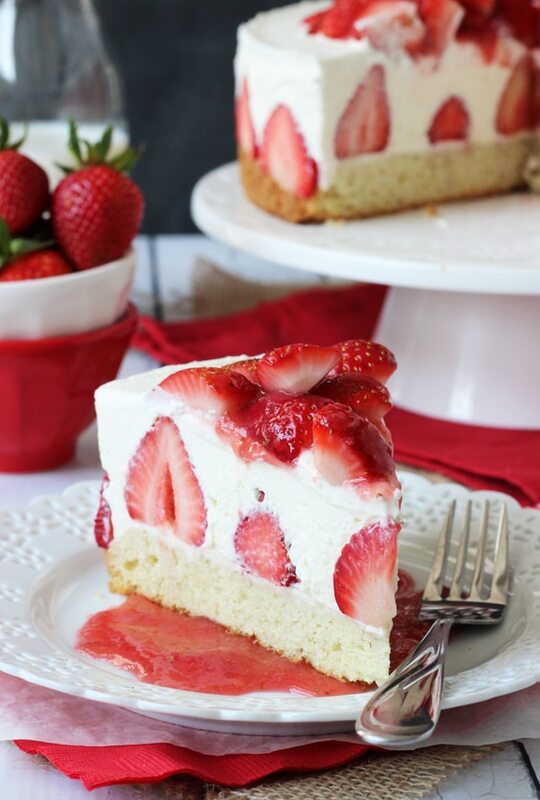 To me it makes sense to have just a cheesecake layer because I think the whipped cream layer would be too soft to hold up the strawberries and sauce on top. Please share your advice on layers for this beautiful cheesecake! Thanks!!! It’s there, it just blends in. You could leave it off if you prefer, but as long as you add the full amount of powdered sugar it’ll hold up just fine. The powdered sugar stabilizes the whipped cream. I just made this today for my daughter’s 20th birthday, (her request)……she LOVED IT!! For something sooo beautiful and elegant looking, it was surprisingly easy to make!! Everyone was very impressed. It easily fed 11 people. I have sent a picture to your email. While not as pretty as yours, I have to say I’m impressed with myself!! Thanks for sharing this with us!! It’s a keeper for sure ???? I’m so glad you enjoyed it! The pictures look great! 🙂 Thanks Sherri! I love this recipe! Unfortunately, I managed to break my perfect shortcake while removing it from springform pan. Since it was crumbled beyond redemption, I made a trifle out of it. Only thing I changed was I sugared the strawberries a little. I may have messed it up but my Strawberry Shortcake Cheesecake Trifle was delicious. Thank you for the recipe! ???? Very smart to make the trifle! Sorry the shortcake broke! Glad you still enjoyed it! I made this for a Mother’s Day brunch. It was amazing and got rave reviews. Thank you so much for such a delicious and beautiful recipe!